The people who dock their boats at Folsom Lake, about 25 miles east of Sacramento, keep track of how dry the reservoir is by how many steps it takes to get from the parking lot to the floating dock. Gomez and his family were getting ready for one of their final boat rides of the year. 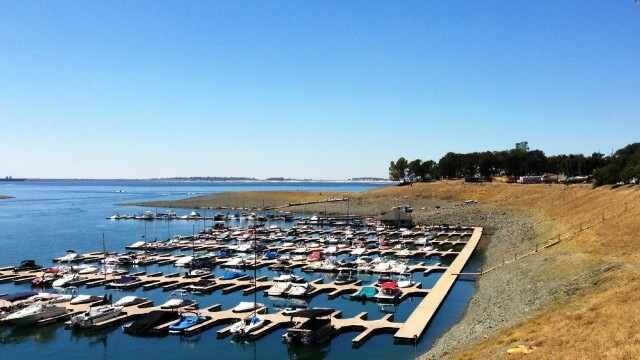 Folsom Lake is at half its capacity, and low water levels will force Gomez and everyone else who docks their boats in the lake to remove their crafts from the water by Sunday, August 11. Folsom Lake’s early boat-removal order is the latest evidence of California’s current dry stretch. The state’s “water year” begins in October. It got off to a “robust start,” in terms of rainfall, according to federal Bureau of Reclamation spokesman Pete Lucero. (Reclamation oversees the Central Valley Project, which manages water throughout central California.) “And then it just fell off the map,” he said. The January-May stretch “was the lowest recorded precipitation year in a five-month period ever,” he said. That’s left Folsom Lake at 81 percent of its typical August average. Other reservoirs are hurting, too. The Millerton Lake near Fresno is the only Central Valley reservoir above average August levels. “Water right now, as it always is in California, is a really finite resource,” said Lucero.